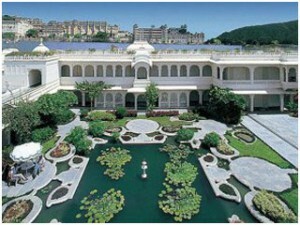 The Lake Palace hotel was The Maharaja’s summer floating palace, which has been turned into a five star Taj hotel and has become one of the most photographed hotels in India. The former palace sits in the middle of Pichola Lake and guests arrive on a boat with an ornate canopy. You may also request a lovely vintage car from the hotel that takes you from the airport to the launch. From far away, the hotel looks as if from a dream, almost like a painting of a hotel floating on water, and once inside, you’ll find it hard to leave the grounds. From the lovely pool to horseback riding to spa treatments to romantic dining on a platform some distance away from the hotel on the water, you’ll never want to wake up from this dream. What you’ll love about this hotel, besides its affordability, is the amazing rooftop terrace featuring Udaipur’s only rooftop swimming pool. You can also enjoy an amazing outdoor meal here as well. 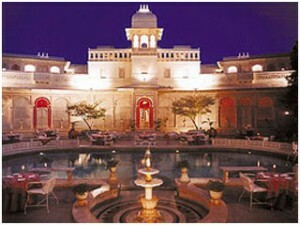 The restaurant serves up a variety of delicious Rajasthani food. Close to all the main attractions, you’ll love having a place to cool off and relax when sightseeing becomes too much in the heat. This wonderful hotel sits so close to the Lake Palace Hotel that you wonder if anyone will notice it, but fortunately it tells a story of its own. 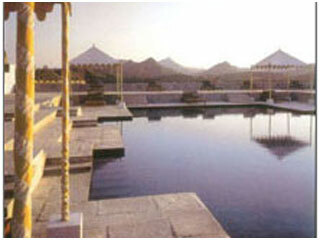 Set along the bank of Pichola Lake, his ornate hotel is a great example of modern Indian architecture. You will arrive by boat and from afar, witness its conglomeration of turrets, cupolas, columns and arches. It gets even better once inside with its pavilions and fountains, frescoes and domed lobby. The sprawling 30 acres the hotel sits upon will have you thinking you are in a completely different world. If you want true opulence, book one of the luxury suites where you’ll have access to your own private pool and personal butler. 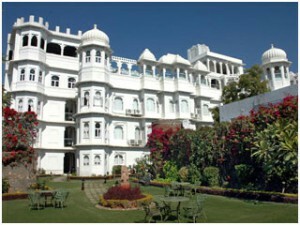 This hotel was once the Maharaja of Udipur’s main palace, and the royal family still lives in part of the hotel. Here you’ll find an inviting oval-shaped courtyard with an beautiful pool, as well as lush ground to explore. Find ornate design, different types of food to chose from in the restaurants, and spa services. For the best rooms, choose the upper level, all of which have private balconies, tons of space, and great views. Twenty minutes from Udaipur, this is one of the best contemporary designs you’ll find in Rajasthan. 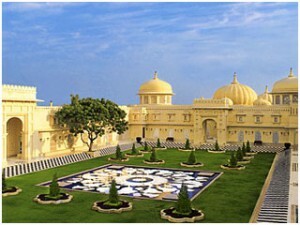 Once a palace, it was transformed into a minimalist Indian playground during the 1990s using traditional style along with marble and metals, as well as semiprecious stones. Some of the luxury suites also have private pools.